HOT DEALS: Save £171 on Q-NAD DAB/CD micro hi-fi system | What Hi-Fi? 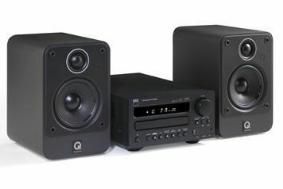 For that you get the NAD C715 DAB DAB/FM/CD micro system, paired with the Award-winning Q Acoustics 2010 speakers. Currently the RRP for the NAD electronics is £500 and the Q Acoustics speakers is £110, a total of £610. But distributor Armour Home has decided to sell them as a bundle, saving you 28 per cent in the process. Alex Munro, Armour's sales manager, says: "When we listened to them together, we all thought this is a great little system that everyone should hear, so we created a special system price which makes it affordable for a much wider public." The NAD C715 has DAB and FM tuners, a USB digital record and playback function, three stereo analogue inputs, headphone socket, subwoofer output, optical digital output and a timer/alarm function with 24-hour clock. Power is a claimed 2 x 20W.